Review date: 17 January 2002. 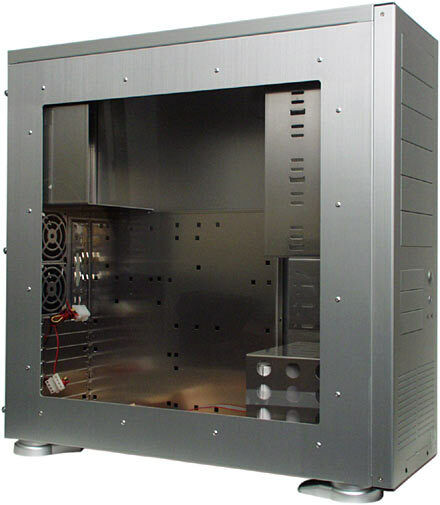 If it is your considered opinion that too much fancy aluminium computer case is barely enough, you won't want anything less than a Lian Li PC-70. Lian Li's PC-60 has been a popular model since before I reviewed it a year and a half ago, and the current PC-60USB (checked out here) brings the drive bay total to four 5.25 inch and eight 3.5 inch. That's enough for most people. If you need more room, though, the PC-70 (originally reviewed here) can fit six 5.25 inch and nine 3.5 inch drives into its large but light 210 by 595 by 595mm (8.25 by 23.5 by 23.5 inches) aluminium body. 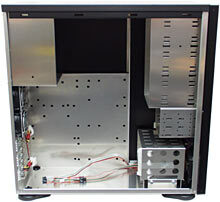 The PC-76 (reviewed here) beats it, with six 5.25 bays and fourteen 3.5 inch bays, but the 76 is a quite seriously gigantic caster-wheeled server case, and it's expensive even by Lian Li standards. The PC-70 is a more manageable size, and it's currently going for $AU489.50 including Sydney metropolitan delivery, but not including a power supply, from Aus PC Market here in Australia. The PC-76 costs almost $AU400 more. Now, this is all very well if the plain brushed-aluminium finish of the PC-70 suits you. This case looks good. It looks professional. But... well, maybe you just don't think it's black enough. That sounds a lot better than "black computer box", doesn't it? It's a PC-70USB, basically - the slightly twiddled version of the PC-70 with four front USB ports under a little drop-down door, and a few other minor tweaks. But it's black. 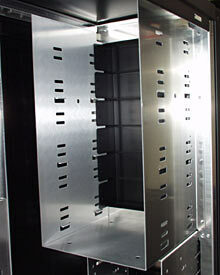 Anodised black, not painted, so you've still got the same brushed-metal finish. And the surface is, as with other Lian Li cases, "hard anodized", which in English means that it's got a thicker layer of oxide on it than it'd need just to hold colour. 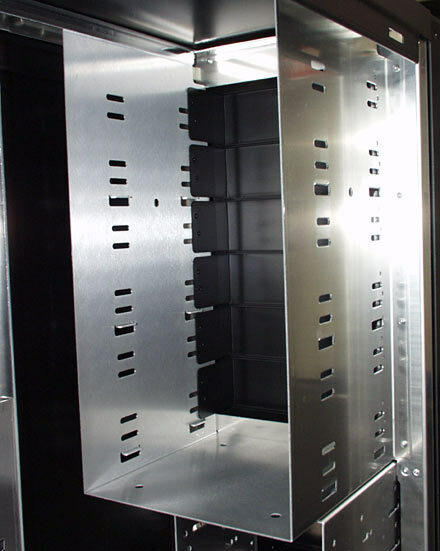 Hard anodising, by definition, gives a surface oxide layer thicker than a thousandth of an inch. That doesn't sound like much, but it's a lot more durable than the ultra-thin layers used on various cheaply anodised objects. So your black case is pretty likely to stay black, thanks to the toughness of the thick oxide layer over the soft aluminium. Inside, the PC-71's got the standard PC-70 layout, except with black-anodised aluminium peeking through all over the place. 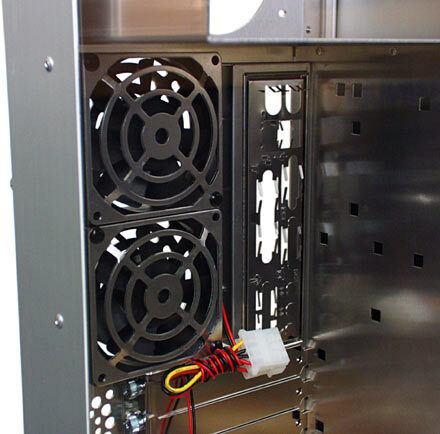 Two rear 80mm fans, two front 80mm fans (with three-position speed control switch hiding under the clip-off front panel), removable 3.5 inch bay cages, non-removable motherboard tray (the PC-60 line has a slide-out tray, but there's more room inside the PC-70 line, so this isn't a terribly big deal). 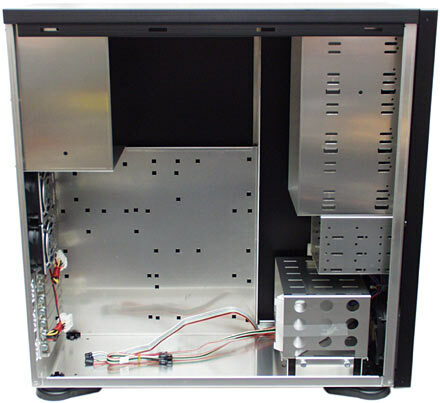 The PC-71's 5.25 inch bays have black versions of Lian Li's now-standard clip-in bay covers. Older Lian Li cases have bay covers retained with screws, but the current ones just click into place. It's also pretty easy to remove the click-tabs from a cover and stick the resulting camouflage panel to the front of a tray-load drive, for a "stealth" drive that won't spoil your black computer pose with its nerdy beige plastic. If you do this, though, you'll need to cut a hole for the eject button, or put up with software-eject only. 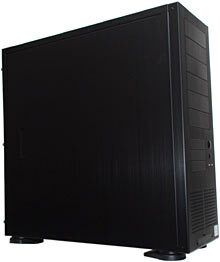 Earlier black Lian Li cases had pale buttons, which looked... questionable. Now the buttons are black, too. The power and hard drive lights in all Lian Lis now are high intensity LEDs, allowing you to use your computer as an amazingly awkward flashlight, if necessary. 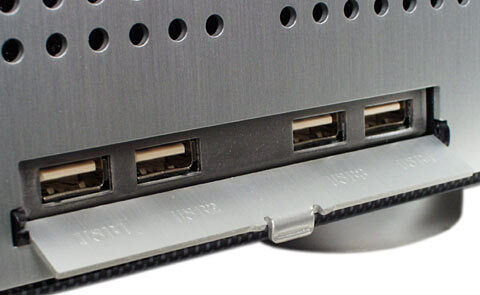 The PC-71 has four front USB connectors, like pretty much every other Lian Li product on the shelves today. 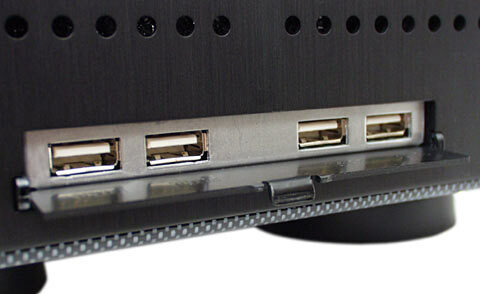 Most current motherboards have headers for at least two more USB ports on top of the ones built into the connector block at the back of the board. 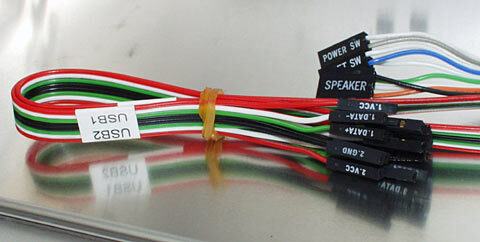 Because there's more than one kind of motherboard USB header, though, Lian Li terminate their USB port leads with a collection of one and two pin plugs. The regular motherboard header plugs (behind the USB plugs in the above picture) are no harder (or easier) to connect than any other case's, but the USB ones are much more fiddly. As I found out in my glow-box piece, the One Million USB Wires Of Doom aren't as hard to hook up as you might think. But on most motherboards you're only going to be able to connect two of the front ports, because there aren't headers for any more. And you're likely to have to pore over your motherboard manual or an on-line reference to find the USB pinout your board uses. Or, of course, you can just say the heck with it and leave the case's front USB ports unconnected. 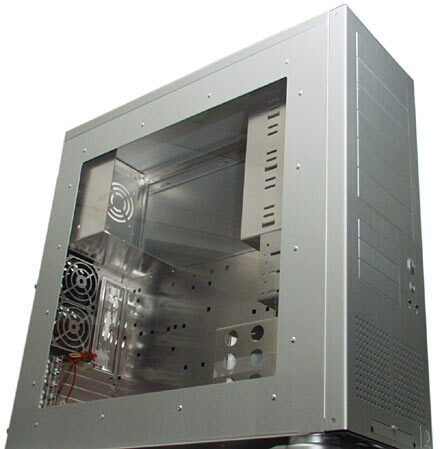 If you're not in love with low-albedo cases, but would prefer a great big case with a window in the side so all your buds can scope your slammin' rig, dude, Lian Li have you covered. The PC-65 is the factory-side-window version of the PC-60, and I like it; the computer I'm using at the moment is built into one (read all about it here). And now there's the PC-75, as well. It's the same idea; just a PC-70USB with a standard acrylic window built into the side. As with the PC-65, the window is retained with metal clips held in place by pop rivets, which means it doesn't need a black rubber strip around it. Because this is a bigger case, though, the window's bigger as well. It's almost square - about 430mm deep by 420mm high (17 by 16.5 inches). The window in the PC-65 is about 330 by 290mm (13 by 11.4 inches). The PC-75 sells from Aus PC Market for $AU550, again without PSU but including Sydney delivery. The PC-75's buttons avoid the Curse Of Beigeness, like the PC-71's; they're only plastic, but they're quite good looking silvery plastic. The LEDs are the super-bright type, again. More front USB ports, attached to more fiddly little cables inside. 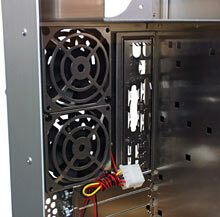 The side window gives Lian Li's show-off fan finger (and cable) guards more of a purpose in life. If you're going to have fancy die-cut grilles inside your computer, you might as well show the world. And because this case has almost twice as much window area as the PC-65, more of your stylin' semiconductors can be displayed in all their disco-lit glory. You can get tower cases that're a lot cheaper than these two. Steel cases weigh more, yes, and the standard Lian Li fans and thumbscrews and easy-access design are all nice as well, but Lian Li cases nonetheless carry a big enough price premium that even people building a whole new cutting-edge computer from scratch do have to stop and think about whether the outlay's worth it. If you want a reasonable level of LAN-party-impressing (or serious-business-client-impressing, for that matter) ph0nk in an off-the-shelf case, though, the Lian Lis are pretty much where it's at. 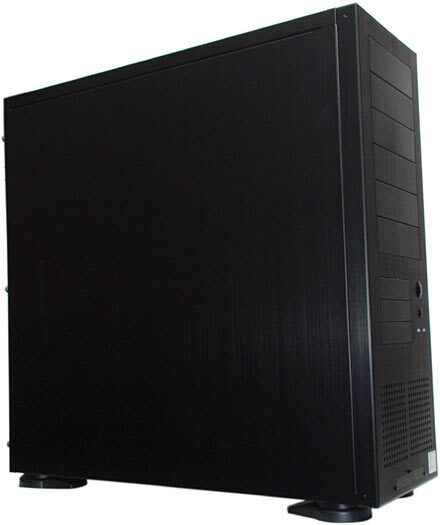 If you don't need the extra capacity of the PC-70 series, get a PC-60 series case; they're just as good and quite a bit cheaper. But, nonetheless, I know that some Aussie readers who may or may not need all those bays haven't even made it to the end of this review. They'll have shot straight off to place an order as soon as they saw that The Case Of Their Dreams was available locally. If you've been hanging out for a black Lian Li with a window, you're still stuck. And if you're waiting for a cheap model - well, I hope you're not holding your breath. Everybody else, though, should now be able to find a box to suit them in this range.